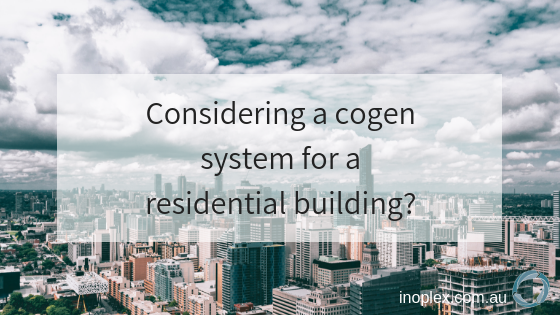 Considering a cogen system for a residential building? Utilising inner-city waste and sewage to generate power and heat for residential buildings might seem like a concept for the distant future but in reality, the infrastructure and systems are already available and implementable now. Not only do these systems provide heat and power at a reduced cost compared with traditional fuel sources, they also offer a green energy alternative to fossil fuel power generation. A recent University of Technology Sydney study on the feasibility of capturing and converting the building waste, eg. food scraps, sewage, fats, oils and grease, to biogas on-site at an inner-city Sydney building development found the idea to be very achievable. With power generated from the biogas potentially providing 20% of residents electricity needs and up to 50% of the hot water requirements. Utilising the waste for energy within the building also reduces the direct costs and environmental impact involved in removing sewage and rubbish, often to distant treatment and landfill facilities. If a biogas power generation plant is not a feasible option for your building alternatives include using natural gas or other fuels to power the cogenerator. Due to the cogeneration system utilising both the electricity and heat produced the unit can provide building power at around 80% efficiency compared with grid power’s 30%. The heat produced by the cogenerator can be used for the building’s hot water supply or space heating, reducing reliance on conventional systems powered directly using natural gas, LPG, or electricity. Cogenerators provide reliable power for multi-dwelling residential buildings removing the issues encountered during grid power outs such as elevator failure, emergency lighting systems, air conditioning loss, and security system collapse. Major power interruptions caused by storms, cyclones, and heatwaves can be avoided. 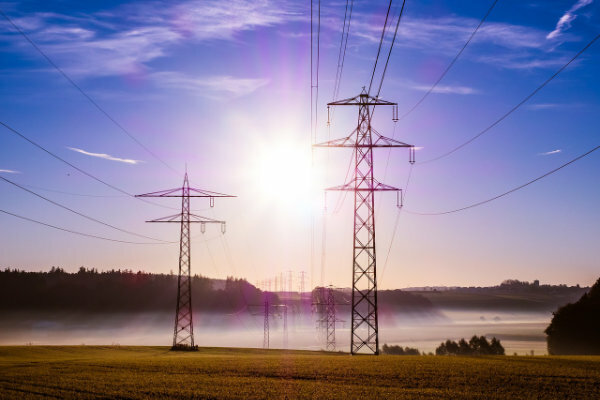 Excess demand for peak power which can result in utility providers initiating rolling power outs such as those seen in the last year in Victoria and South Australia can be a worry of the past once the cogen power plant is established. Using biogas cogenerator produced electricity reduces the building’s carbon footprint and methane emissions providing a positive environmental effect on the local area. Inoplex cogenerators utilise internal combustion engines powered using a choice of fuels including biogas and natural gas. Cogeneration power can effectively decrease the body corporate electricity cost for common area lighting, air conditioning and exhaust systems, pool filtration and chlorination, emergency and security systems. Depending on the metering system in the building cogeneration can be used for both common areas and residents, or common areas only. The CHP system can be set up to run continually providing supplementary electricity to the building every day or in ‘island mode’ to kick in during mains grid power outages. Cogeneration units are often housed in the basement’s or on the rooftop of a multi-storey building which ensures the system causes minimal disruption to residents. CHP systems can be installed during the construction of the building or retrofit into existing electrical power and hot water infrastructure. Is cogeneration right for your building? Opting for a cogeneration system in a building can pose a lot of questions and considerations for Body Corporate or strata management committees. The team at Inoplex offer guidance and expert advice at every stage of the project, carrying out feasibility reviews, presenting practical, energy efficient design options, as well as overseeing construction, commissioning, and testing. Melbourne’s recent blackouts have highlighted the need for businesses to invest in reliable, clean power alternatives. The perfect storm of conditions led to many businesses and homes losing power for hours. Soaring temperatures, scheduled power generation unit repairs, as well as two other power generators being offline for unexpected reasons, led to unmaintainable power demand. Despite the Australian Energy Market Operator juggling energy resources and importing power from neighbouring states, even across the Tasman, and paying larger users to power down, the demand was too high. Power companies were forced to load shed, or cut the power, to many areas of Victoria in order to protect major electrical systems. How power outs affect you depend on many factors, however, if you are in business the consequences can vary from inconvenience to a major operational and financial disaster. 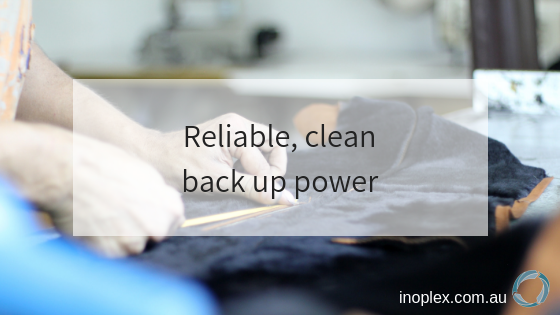 If your company relies on a constant source of power, which most do, investing in alternative back up power generation options in light of the expected increases in power outs across the ageing power grid is becoming more of a necessity rather than an option. CHP or Cogeneration offers a practical, energy efficient reliable power generation option for business, manufacturing, and farming. With reduced installation costs compared with diesel generators, cogeneration generators are a practical choice for a range of businesses. If your company depends on a solid supply of power every day of the year for refrigeration, heating, cooling systems, lighting, or machinery speak to our team about cogeneration today. 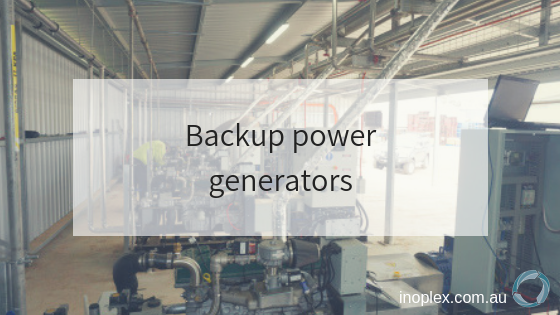 Diesel generators have been used for decades as a backup power supply for many Australian businesses who need power security; a backup power supply when the mains power is off or out of specification (eg a brownout). Back up generators are often built inexpensively with a short life expectancy, as they do not run for too many hours per year and the diesel engine driving the alternator provides plenty of torque to maintain speed, corresponding to power AC frequency, when large electrical loads are switched on. This solution works well. The standard, ISO 8528-12 defines that the block load, or Load Acceptance, for diesel generators as a maximum electrical load that can be applied before the speed drops by more than 10%. Diesel generators can typically accept 50% of their maximum power output, but every manufacturer will provide their own block loading values, often when the engine is warm. So, even with a backup generator, there is typically a period of no power between when the power grid fails, the backup power generator starts and then warms up to take the load. A cold engine will perform worse so heaters and glow plugs can be added to speed up engine starting and load acceptance. Gas engine generators typically have lower % load acceptance than diesel generators, particularly lean burn engines that provide enhanced attractive fuel economy, but at the cost of torque and load acceptance. This is fine when the site is running in parallel with the utility grid as step loads power can be seamlessly imported from the grid for a few seconds while the generator steps up to the higher demand. However, they are not as useful as site back up generators if the site as larger loads. For some biogas generators, they are sold as grid paralleling only and unsuitable for off-grid power as their step load is too poor. In this case, the site may need to have generator CHPs for normal operation running parallel with the grid and a separate diesel generator for back up power supply. We believe that this is a poor outcome for the site owner and operator with more equipment to buy, install and then maintain. Seeing this cost at our client's operations, the engineering team at Inoplex have developed our next generation of inverter generators to address this needless site cost and complexity. We have worked to develop a gas engine with dramatically improved load acceptance so that it can provide both power paralleling with the grid and back up power when the grid is down or out of specification. And yes, it can do this with poor quality biogas too, without just resorting oversizing the generator! Our inverter CHP engines run lean, or with an excess of air, to achieve excellent fuel economy by burning all the available fuel when running with the grid. When the grid is down or out of specification, the CHP runs in "back up power" or “island" mode. In island mode the engine runs as a “stoichiometric" engine, meaning that the amount of oxygen in the combustion air matched to the fuel provided which yields improved torque and instantaneous response to increased block loads. While this approach provided a significant gain in block loading performance for our customers, we decided we could do better and control the power quality tighter. The inverters on our CHP always provide the required power frequency and voltage, regardless of engine speed. So, even if the engine starts to slow or head towards a stall because a large step load is applied, the power produced by the CHP will still be precisely 50 Hz or the value required by the site. So, our second approach to producing a biogas engine with leading step loads is using the power electronics to compensate for the momentary slowing of the engine. But, we soon realised we can do better than even this…. Our standard design has banks of capacitors storing electrical energy on the DC bus within the power electronics. Just like a heavy flywheel has mechanical mass, rotating at speed that can be converted from mechanical to electrical energy when a block load is applied, our capacitors have stored energy, ready to top up the supply of power as required for a bock load. This is the third layer of our block load approach to assist clients operations to run smoothly when the grid has failed. When considering CHP Cogeneration for your site, think about the benefit of having one generator system that is able to provide power security without the need and costs and complexity of an added back up diesel generator too. We¹ve just experienced our hottest summers day in 3 years in Melbourne, at 42.8 C. These extremes temperatures are harsh on us, our pets and livestock, gardens, and equipment including electrical appliances and generators. The utility power grid is stressed by these conditions too and we experience brownouts and blackouts during these time as well. This is why owning a generator designed and built for these tough conditions is essential. 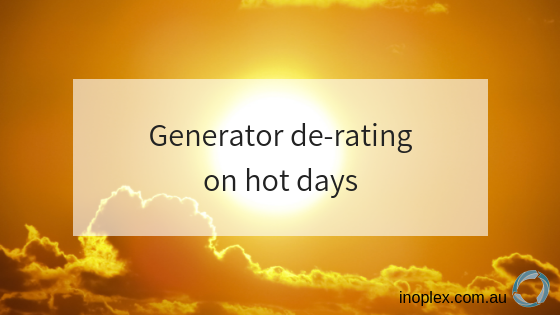 However, you would be surprised how many generators are actually designed for lower temperatures and do not cope with the harsh Australian summer, which is exactly when you need them to be working at their peak. Some small turbine generators start to reduce their power output from just 20℃ and some European generators are limited to 40℃ ambient. As the air heats up it expands or its density reduces. Hotter air provides fewer oxygen molecules for burning in an engine or turbine, so the potential power is reduced for some generators. Hotter, less dense air also provides less cooling for parts that get hot and rely upon air cooling, so increasing ambient temperatures can be a big deal. The density of air at sea level 15℃ is 1.255 kg/m3 according to ISA (International Standard Atmosphere) but on a hot day of 40℃, this is reduced to 1.127 kg/m3 (source https://www.engineersedge.com/calculators/air-density.htm), a 10.2% reduction in the mass of air available for cooling and combustion. Think about the impact of a 10% reduction off the top of your generator performance on a hot day, right when you need it most. CHP’s are often installed within plant and equipment rooms along with other equipment that produces heat. These rooms can run warmer than the ambient temperature and be a comfortable place to visit on a cold winters day but horrible during summer. A 40℃ ambient day can be 50℃ in a plant room or shed, even with ventilation. The Inoplex CHP generators are designed to power through hot summer days and provide reliable power when you need it most. Our power electronics will run at full capacity until a very uncomfortable 50℃ as standard, with higher temperatures available upon request. We design the engine combustion and air delivery systems to also run efficiently up to 50℃. If you are considering a CHP generator, make sure you cover off the full range of operating temperatures and ensure you have the capacity for when you need it on those hot summer days. Current in Australia, 75% of all electricity consumed is generated by 3 companies. Furthermore, the majority of this power is generated in centralised locations and then transported via the power grid to the end user. Historically, power stations in Australia have been located near to where their fuel source was. Either near the coal fields for coal-fired power stations, or near dams for hydroelectric. This made a lot sense, as it was a lot more economical to transport electricity via the grid than it was moving coal; and obviously you can’t move a dam. However, the issues with this model are the costs of building the infrastructure required (Power Stations and the Power Grid) meant that competition would always be kept to a minimum. The biggest disrupter to electricity generation has been the development of renewable energy generation. This has allowed us to generate electricity in a lot more places to where we used to be able. In fact, it has been estimated that about 13% of our electricity usage in Australia is generated by decentralised, renewable energy sources. What are the advantages of decentralised power?